The Versa design serves aesthetic, acoustic and protective purposes. Versa’s signature high-density and durable plastic exterior showcases a glossy finish that is easy to clean and never rusts. 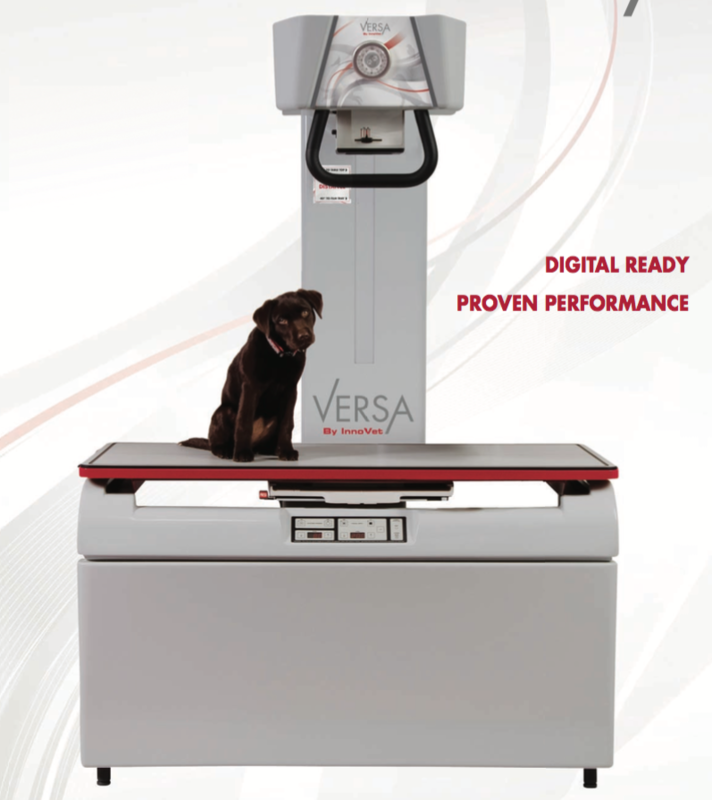 Versa’s unique molded corners prevent hip-level bruising that is common to veterinary technicians. A fully-encased tubestand and cover safeguard staff & patients from exposed electrical wires. Table-level animal restraints, which come standard, minimize unnecessary technician exposure to radiation. 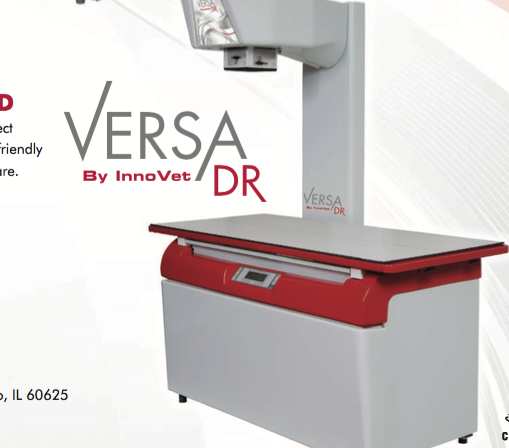 Both Versa and Versa DR come standard with a High Frequency generator and versatile integrated tubestand. 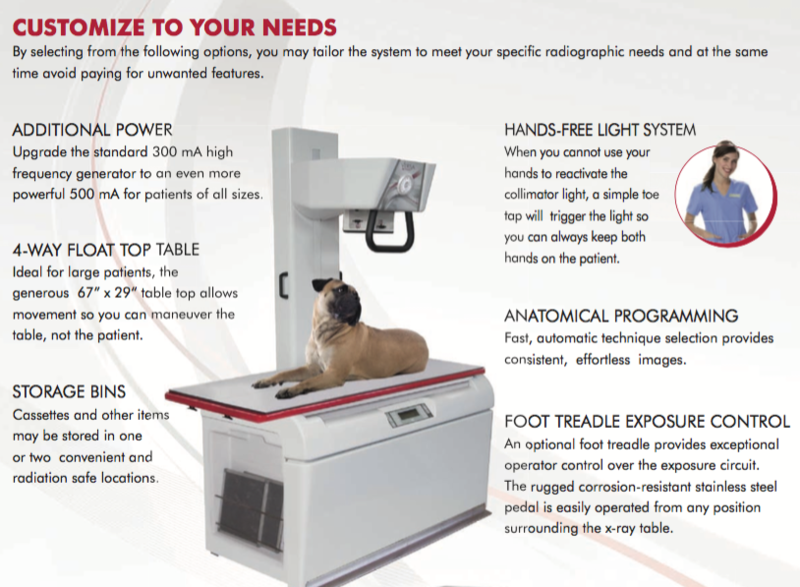 Like all InnoVet products, Versa can be customized to meet the specific needs of your practice. • Bolts to floor are recommended. • All cables enter from rear or side of table. 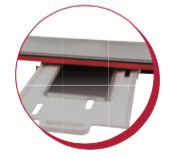 • Front covers of table are removable for internal access. • 240 VAC, single phase, 100 Amp disconnect, 200 Amp maximum momentary load. • Maximum line voltage drop under full load conditions not to exceed 5%. • Recommended copper wire sizes are #2 for 50’ run, #00 for 100’ run, 250 MCM for 200’ run. • The generator provides 24 VDC and 24 VAC supply voltages for table locks (4-way float top table only) and collimator, respectively.